I should've been in bed a half hour ago, but I stayed up a bit longer to get this feature functional. This evening, I've been working on the breaching charge. In a nutshell, it's a special item that will blast through thin walls and doors, creating a unique entry point whilst killing and stunning enemies in certain ranges. It's been a bit of a complicated one, since there were a lot of direction and angle calculations to consider. Firstly, the charge had to sit in the middle of the surface it was placed on, so it cleanly blew up the portion of wall it was aligned with. 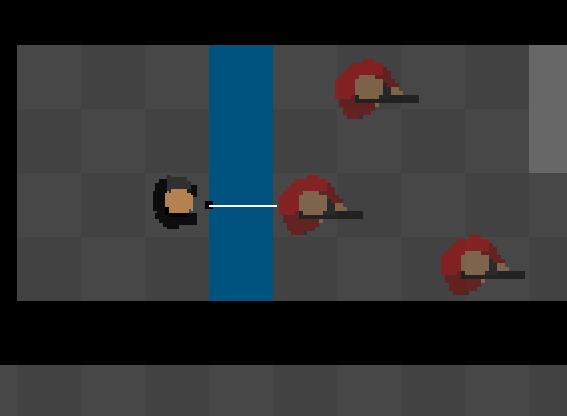 This was tricky for me, as there was no short way of determining which face of the wall was closest to the player. It's still a bit buggy, if you're half way between wall segments it'll choose either the above or below segment, it doesn't look natural. That's something I'm going to smooth out tomorrow hopefully. An important note. Everything, everything is place-holder. The art most of all. I'm working entirely on the code right now, so no art will be remotely close to the final art until the code is solid. Expect coloured blocks, weird 1 pixel wide lines and debug text abound. Black squares indicate an area that can't be breached. These will be used for door frames, wall corners and windows. Blowing up everything would be fun, but this isn't Red Faction sadly. Blue walls indicate flimsy/weak walls, the kind that don't react too kindly to controlled explosions. 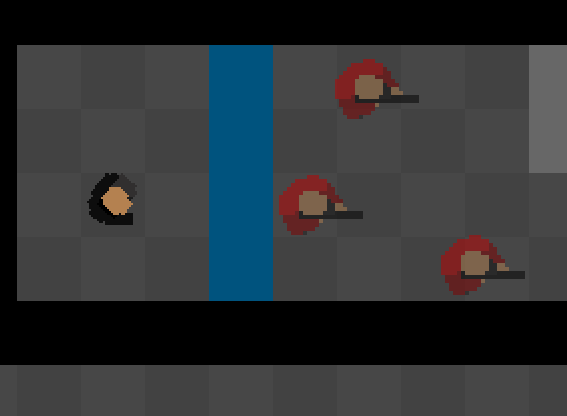 The guy in black is the place-holder player agent, and the red guys are place-holder enemies. Placing a charge on a blue wall. The white line is a debug aid I was using to help me monitor which surface the charge was stuck to, and in which direction the charge will detonate. Pressing the key again, after a short delay, detonates the charge, destroying the wall it was placed on and creating a lethal, directional blast. Anything close to the wall will be.. well, dead. Anything further than that will be stunned by the shock. The guy closest to the wall is no more. His allies are stunned, deafened by the blast for a few seconds. This gives the player the opportunity to dive in and get in a few bonus shots. I'm quite happy to have gotten this feature up and running in an evening, it needs some fixing but it's functional. Tomorrow, I intent to fix up this feature and work on the magnetic field. "What's the Magnetic Field?" I hear you ask. Well, you'll hopefully find out tomorrow. It's been a while since I last posted, a lot of things have changed in the interrim. Not to the game, just my general situation. First of all, I've moved down south, so that was a biggie. I've been waiting to start a new job so that had been killing my energy, I was just waiting to start so I would lounge around all day just existing in this weird limbo mood. I've been doing artwork for an indie title, which has been a priority. Also, XCOM2 War of the Chosen came out, which didn't help either. What I've been working on, on and off, is a form of procedural level generation for AGGRESSOR. I wanted to be able to zoom in and out during gameplay, so the player could adjust their view depending on the size of the level they're in. In close quarters, you want it up close so you have good situational awareness. In open areas, you want a good view so you don't get out ranged. A serious technical problem with this was that tiles would have a seam. I read into the technical reasons for this, but the easiest way for me to explain this is like mip-mapping in 3D. You need a decent bleed so if the hardware over-samples it doesn't pull empty space or adjacent pixels. 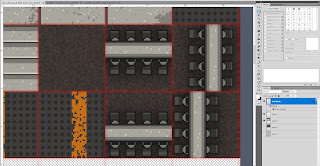 So, I had to spend a little while tonight putting a 2 pixel bleed around EVERY tile. Urgh. Tedium. But ultimately, you do what's necessary don't you. 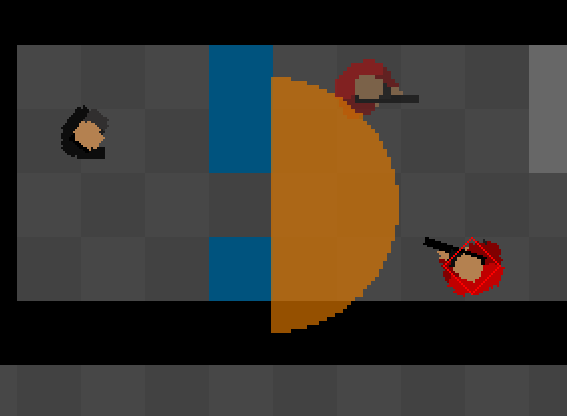 Basic foundation for mission objectives in place; in this instance, Assassination. Kill the target, then the exit becomes available -- but if you were spotted or heard reinforcements are called and search the map for you. Currently, reinforcements are endless. The idea behind this is you're not supposed to stand and fight, you're supposed to run. Assassination missions are heavily stacked against you by thematic design, so letting you blast the reinforcements and then be left with an queit map seems like the opposite of what is intended. If you stick around after murdering an important person, you're going to be overwhelmed by armed & armoured guads. These reinforcements also have body armour, making them tougher to fight if you're not packing an armour-piercing weapon. So, if you're packing stealth weapons, you really CAN'T slug it out.